What Does It Take to Be a Wearable? When Does a Wearable Become Fashionable? Keywords – Wearables, Fashion System, Social Acceptance, Design Research. Citation: Tomico, O., Hallnäs, L., Liang, R.-H., & Wensveen, S. A. G. (2017). Towards a next wave of wearable and fashionable interactions. International Journal of Design, 11(3), 1-6. Copyright: © 2017 Tomico, Hallnäs, Liang, & Wensveen. Copyright for this article is retained by the authors, with first publication rights granted to the International Journal of Design. All journal content, except where otherwise noted, is licensed under a Creative Commons Attribution-NonCommercial-NoDerivs 2.5 License. By virtue of their appearance in this open-access journal, articles are free to use, with proper attribution, in educational and other non-commercial settings. Dr. Oscar Tomico is head of the Design Engineering Bachelor program at ELISAVA Design and Engineering School, and an assistant professor in the Department of Industrial Design, Eindhoven University of Technology, working on soft interactions for the Wearable Senses Lab. Current projects focus on the textile industry and involve stakeholders during the design process to create ultra-personalized smart textile services in the form of soft wearables. He is involved in research projects such as ArcInTexETN (2015), CLICKNL Crafting Wearables (2013), and CRISP Smart Textile Services (2011). He has been a guest researcher and lecturer at the Textile and Design Lab, Auckland University of Technology (NZ), TaiwanTech (Taiwan), the Swedish School of Textiles (Sweden), the Institute for Advanced Architecture of Catalonia (Spain), and Aalto University (Finland). He has co-organized events such as the Waag Careful Designs and Hypercrafting Fashion events (Amsterdam), Baltan Open Lab: Wearable Senses workshops (Eindhoven), Crafting Wearables (Arnhem) and DHUB Smart services, smart production, smart textiles (Barcelona). He has curated exhibitions such as “Systems Design – Eindhoven School” (DHUB, Barcelona), and “Smart Textiles – Wearable Services” (TextielMuseum, Tilburg). Dr. Lars Hallnäs is senior professor in interaction design at the Swedish School of Textiles, University of Borås. He has a background in philosophy and mathematical logic and is docent in logic at Stockholm University. Besides research in design theory he has done research work in mathematical logic, computer science and experimental interaction design. Lars has an education in musical composition and has been active as a composer since the 1970s. Dr. Rung-Huei Liang received his PhD in 1997 from the Department of Computer Science and Information Engineering at National Taiwan University, Taipei, Taiwan, ROC. He is now an associate professor in the Department of Design, National Taiwan University of Science and Technology. His research interests include interaction design, design fiction and embodied interaction. Following the third wave of HCI, he conducts research projects with a phenomenological approach and advocates poetic interaction design. He is highly interested in experiential qualities such as serendipity, synchronicity, reflexivity, déjà vu, and Mandela effects. He leads the Spatial Media Research Group, which focuses on interaction design, virtual reality, aesthetic computing, and speculative design. He actively participates in academic communities and activities such as ACM SIGCHI, Taiwan CHI, Taiwan Art and Technology Association, DIS, DPPI, and IASDR. He is also involved in leading students to create critical forms of interaction by speculating on technology as a thought experiment. Dr. Stephan Wensveen is a professor in the department of Industrial Design at Eindhoven University of Technology. He studied Industrial Design Engineering at Delft University of Technology, where he was one of the initiators of the ID-Studiolab design research studio. He began his research on the relationships between emotions, expressivity and product design in 1999. He gained his PhD in 2005; his thesis aimed to bridge the tangible interaction, affective computing and product design communities. This PhD work helped to develop design methods and research articles that are now part of many international design curricula. Since 2005, he has served on multiple conference review committees and was keynote speaker at DPPI’07 (Designing Pleasurable Product and Interfaces conference) and SIDeR’08 (Student Interaction Design and Research conference). His current interests are in using the power of design to integrate research, education and innovation, especially in the areas of textiles and electronics. Fashion and technology have had intertwined cultural and material evolutions. From the mechanical engineering of the 19th century that facilitated large-scale textile manufacturing, to the chemical and synthetic developments that introduced today’s material landscape, fashion and technology are modern industrial doppelgangers built on a twinned ingenuity. As technology becomes more intimate (both in distance to the body and in its ability to act as a conduit for informational and personal identities), materials, and more specifically textiles, are increasingly called upon to “perform” via responsive interfaces. While early wearable technologies aimed at solutions for how to “wear” computational devices on the body, current design challenges in the field hinge on enhancing social adoption and cultural relevance. Interest in design for wearables is in part driven by technology’s ongoing shifts towards social awareness, aesthetic viability and ultimately fashionability. Specifically, wearable devices engaging with the (social) body offer new challenges for bridging material and industry disparities that have so far differentiated fashion from technological culture. By engaging with the body, the design framework of wearable technologies necessarily enters the sphere of the social, sensual, sentient, and communicative body—thus heightening the need for cultural and social connectivity as found in fashion culture. Wearable interfaces for the body—such as interactive accessories, haptic devices, smart-textile second skins, or enhanced digital design platforms—must necessarily connect with wider social concerns if they are to be adopted for everyday use. One of the practical challenges in shaping this nascent field of fashionable and wearable interactions, which we may also refer to as fashiontech, is that of balancing human–computer interaction aims with aesthetic resonance and social coherence for the user. Within the practical and academic spheres of industrial and interaction design, new design methodologies and material explorations are being tested and developed with the aim of delivering balanced form and function outcomes. This issue offers some examples and key pathways towards exploring culturally (a)wearables (culturally aware wearables) that expand and refine current as well as future relationships with the burgeoning field of fashionable responsive objects for the body. Wearables include clothing and textile-based accessories that incorporate smart textiles and electronic interfaces to enable responsive and interactive experiences. When designed well, they leverage the cultural, sociological and material qualities of textiles, fashion and dress, the diverse meanings of the body, and the qualities afforded by smart and programmable elements (Tomico & Wilde, 2016). Moreover, designing, developing, producing and deploying wearables in the form of smart textiles opens up a vast field of opportunities for textile developers and product and service designers to combine their disciplines in application areas such as well-being and lifestyle. Knowledge on programming smart materials allows us to design new textile-based biofeedback applications for relaxation, gaming, psychotherapy and medical diagnosis, integrate neonatal monitoring in various contexts ranging from intensive care units to private rooms or family-centred care, and study how smart textiles can make modern digital technologies meaningful and socially acceptable (e.g., Vibe-ing, see Figure 1). 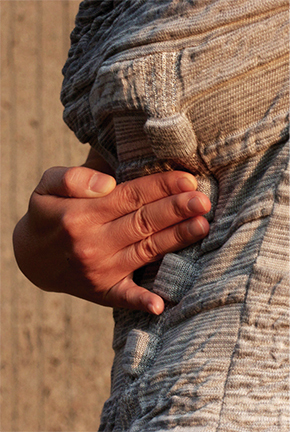 A self-care tool in the form of a knitted garment with integrated vibratory actuation. Designing for wearable interactions forces designers to consider a range of requirements that do not typically demand focus when designing products that are not worn, like a teacup, a tablecloth, a computer or a smartphone. Wearable interactions blur the boundaries between the object of design and the subject of the action. Wearables are the maximum expression of an embodied object. Like clothes or accessories, they are literally on the body for long periods of time. Thus, as with garments and accessories, fashionable and wearable interactions call for a particular sensitivity for material details, an eye for fit and comfort on bodies with perhaps diverse and idiosyncratic movement capabilities, openness to a diversity of meanings that may be generated, and consideration of wearers’ intimate relations with technology (Tomico & Wilde, 2016). Let us take again the example of the smartphone. If it were to become a wearable, it would need a place on the body. Where would that be? There are clearly places that won’t be acceptable: on your forehead (it would look stupid), the palm of your hand (you won’t be able to grasp stuff), on your back (you won’t be able to reach it), or on the back of your head (you won’t be able to see it). Moreover, it is completely different to design things just to be used than to be used and worn at the same time, especially when bringing technology close to the body. The object of design is no longer separated from the subject of the action (use). As we can see from the wearable smartphone example, using merges with being, and the object becomes part of the subject. This change has clear implications for how functionality is presented and becomes explicit during use. We don’t need to have all the functionalities ready and defined all the time. It would create friction between how a person wants to behave and act, and what the functionality allows. How many apps could we use from our arm besides sport related ones? Can we write a message? A poem? How will people look at you if you keep looking at your upper arm and continually touching it with your fingertips? Let’s take a close look at Vibe-ing (see Figure 1), designed at the TU/e Wearable Senses Lab (Tomico et al. 2014). One might think that designing a personal care garment that allows for self-massage is an easy task. What if we were to say that the starting point of the design process was a super–thin, glowing piece of cloth? 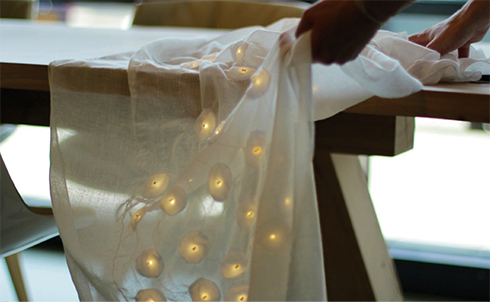 Vibe-ing was born as “Soft Interiors” (see Figure 2), a lightweight, almost breezy sheer fabric with embedded lights that give off a pleasant glow. Its fabric was integrated with a wireless charging battery and charging plate. In 2011, Soft Interiors was one of the first examples of a light-emitting textile that is pleasing to look at and to touch and handle. The promise of light that flows gently with the movement of textiles had an almost fairy-tale like appeal. It was as if light came close to you, making it mouldable in your hands. Until then, light-emitting textiles had made the textile thicker and more rigid to accommodate the integration of hard electronics. Soft Interiors was an example of how one can combine textiles and light in a pleasant way. It kept the soft, airy qualities of the textile, and added the warm quality of light. In order to design this interior piece, it was necessary to integrate existing materials with experiential and explicit knowledge from the separate domains of interior design, textile, and technology, as no single actor could meaningfully understand, design and realize it. A semi-transparent woven fabric with laminated LED lights and inductive charging. As a piece of cloth, Soft Interiors was a perfect home accessory. However, when worn on the body as a scarf, it made parts of the body visible that one might not want to be seen (see Figure 3). Shadows highlight and hide part of us. They change our silhouette. This is exactly the issue that a wearer faced with Soft Interiors. The lights were always on. There was no way to control them, no way to switch some of them off besides hiding them with one’s hands. It was the action of wearing the item that revealed the need to be in control. It gave hints on what to highlight and what to hide. It provided information on where the lights should be placed and how to activate them, and even about the texture and type of textile to be used. It was clear, after trying it on, that making Soft Interiors wearable would require adding a first-person perspective approach to the design process (Tomico, Winthagen, & van Heist, 2012). It was immersing the designer in the process as a user that allowed for a rich sensory exploration of materials. Material explorations on the body in context allowed the designer to think through—and with—the full range of their movement capabilities and perceptions, and to focus on subtleties, small details that make an experience rich. 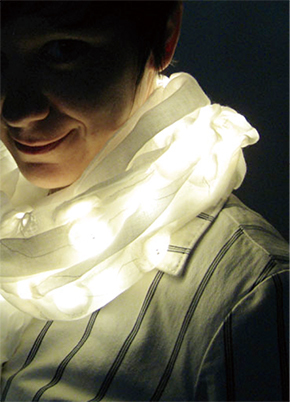 The interior piece worn as a “glowing” scarf. Tender (Kuusk, ten Bhömer, & Kassenaar, 2012), a touch-sensitive garment, was the result of taking such a first-person perspective. 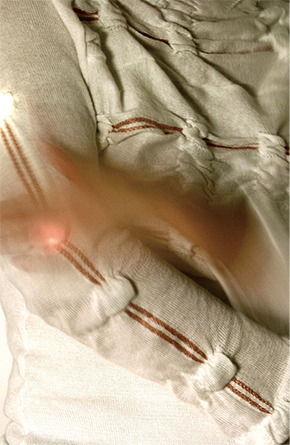 Tender was a garment that reacted to stroking (see Figure 4). It lit up separate pockets on the body according to how they were in contact with the skin. By stroking the garment, it was possible to “move” the lighted part of the wearable. It could be used to gather light around the neck, chest, and hands, for all kinds of playful effects. The textile was a structural knit that incorporated programmable microchips in integrated pockets all over the material. It could be programmed to react to different inputs, perform a range of actions, and give desired outputs. A touch-sensitive garment was just one of many possible applications of the developed textile, but it was the most interesting. The conceptual fur-bubble-inspired look, the soft light and the personalized interaction were seen to be what luxury could mean in the future. From designing Tender, it became apparent that in order to make wearable interactions fit the wearer, their meaning should emerge from the interaction (Wilde, Vallgårda, & Tomico, 2017). However, even though Tender could be controlled, the interaction was not as direct as it might have been. The state of the lights could not be felt with the fingertips. One needed to look to down at the body to understand what was going on, breaking the flow and making it look as if you were playing the computer game Simon with your body. Other options were to “perform” in front of a mirror or to look at the reactions of the people around to change the state and position of the lights. None of them was successful enough to support the use of Tender in everyday life. A knitted garment with integrated LED lighting and conductive cables. The third and final iteration was Vibe-ing (Jeon, Kuusk, ten Bhömer, & Asjes, 2013), a self-care tool in the form of a garment which invited the body to feel, move, and heal through vibration therapy (Bhömer, Tomico, & Wensveen, 2015). The fully fashioned merino wool garment contained knitted pockets in which were embedded electronic circuit boards that enabled the garment to sense touch and vibrate on specific pressure points on the body (see Figure 5). By integrating vibration actuators in textile pockets the design enabled programming of the exact areas and mode of stimulation on the body depending on the specific person’s need for rehabilitation and healing. Using technology it becomes possible to customize the garment to the preferences of an individual body. The change from light to vibration allowed for a direct mapping between action and reaction. By touching the pockets containing the electronic boards and the vibration motors, one could instantly feel the vibrations. The textile worked as a composite material (Vallgårda, 2014) where input and output were integrated. It was this direct mapping that allowed users to explore and find multiple ways to make the garment fit their own bodies, for certain actions in specific contexts. The wearable became open in terms of its use. Wearing it was the closest one could get to wearing an ordinary garment. However, one question still needs to be answered. Can we consider Vibe-ing fashionable? Applying pressure to one of the vibration points of the garment. From the perspective of fashion, clothing is our first social interface. Clothing functions as an important and necessary social tool that interfaces our bodies with society (Barnard, 2014). Through clothing we inform others of our personal and collective affinities via subtle visual and tangible codes. Wearables, for their part, propose complex challenges towards becoming (fashionable) social interfaces. While technology trends point to greater awareness in design aesthetics, the hybrid and heterogenic material and usability landscape of wearables offers no unique pathway towards fashionability. Wearables designers need to explore unique material and interaction scenarios that have yet to be stylistically mapped in their quest to find form factors that connect use with aesthetics. Hence, in order to consider how the social functions of technology converge with the social functions of dress (Buechley, 2008), designers dose technological novelty with known sartorial codes. When technology becomes clothing++, new considerations arise for the desired social interfaces. When adding technology—sensors, visual and haptic outputs, shape- and identity-shifting materials and forms—one has to consider how these converge with the social and stylistic reading of the garment/design. Any artefact placed on the body takes on social meaning in relation to its wearer (Dunne, 2010) When technologies are placed on bodies they participate in informing the aesthetic and communicative layer of fashion that comes to constitute the social self. While fashion and technology collaborate in a flow of redesigning social inscriptions informed both by trends and by personal expression, a fine balance between uniqueness and conformity already informs fashion choices. “Fashion is negotiated on a communicative basis within society… the social limits of toleration are also being continually renegotiated… which is why acceptance of innovative creations and ultimately new fashions develop at all” (Loschek, 2009, p. 142). Wearables participate in a new extra-expressive layer for the socially dressed body that comes to communicate both commonalities and particularities in the fashion ecology. Fashiontech, though pushing the limits of materiality and socio-personal expression, must still “fit” into a spectrum of general legibility for the wearer. It is perhaps for this reason that the first wave of wearable consumer goods capitalized on jewellery form factors such as watches and bands, which were already participating in the communication of information (time). Today’s next wave of fashiontech addressing the totality of the body comes to constitute a new technical, social and aesthetic challenge. Much of the shift is predicated on the evolution of style, through which new technologies will come to be accepted. In the same way that style is both a new yet recognizable iteration on the body, technology will need to seek its own stylistic sartorial language in which both wearer and viewer will recognize her/himself as well as discovering the ongoing newness of fashion. Loschek (2009) has noted a gap that exists between invention and innovation in acceptance and adoption by society of the new clothing items, and has begun to define it as a part of the fashion dialogue. This special issue on designing for fashionable and wearable interactions presents a converging roadmap for the future. The articles in this special issue should be seen as possible answers, directions to follow in the journey that design research needs to take to become situated. They present best practices from the fields of textile, fashion, and interaction design. Each of them exemplifies a departure from current design research practices and makes explicit the transitions necessary to situate wearables in society. What is the role of the body in the sociotechnical system of fashion? As Entwistle (2000) says, it is the body that fashion speaks to and it is the body that must be addressed in almost all social encounters. Is it not the case that fashion is not just worn by bodies, but also designed, produced and communicated by them? “Digital Materiality, Embodied Practices and Fashionable Interactions in the Design of Soft Wearable Technologies,” by Frances Joseph, Miranda Smitheram, Donna Cleveland, Caroline Stephen, and Hollee Fisher, explores wearable technologies as interfaces on, into and beyond the body. With the goal of challenging functionalist and techno-futurist thinking, it introduces some new approaches to the development of soft wearable technologies and smart clothing based on embodied imagination (Hansen & Kozel, 2007). These approaches integrate the body into the design process in an open-ended way. The first project aimed to augment the body, using innate gesture and posture. Thus the body became a tool to explore how to activate the sensors and trigger a response. The second project focused on body posture as a form of communication, where wearables supported the expression and extension of character. In this project the body was recognized as the context of application. How do we open up the design process to explore and collaborate in the sociotechnical system of fashion? As McCann (2016) asks, how does the co-design process need to evolve from designing for users to making the persons involved active contributors (rather than passive recipients)? In the article “The Hedonic Haptic Player,” Anna Vallgårda, Laurens Boer, and Ben Cahill describe the iterative design process behind developing a platform for future open-ended explorations of vibrotactile expressions. Instead of implementing vibrations as a haptic output for some sort of communication, they explore the enjoyability of vibrations in a wearable setup. The authors went back and forth between the technological development of the platform, and the responses and reflections on experiencing temporal form expressions. By developing and using the platform, they became familiar with the experiences of the different dynamics and rhythms. They gained an understanding of how different transitions, strengths of vibration, and recurrences of events would feel on their bodies and what effects each of them liked. Situating the designer in society means taking into account social repercussions that an individual may receive, the social weight (Dunne, 2014). Is there a way to anticipate being inappropriately dressed? How can designers deal with unwanted attention or negative responses that an individual may receive? Trine Møller and Sarah Kettley’s article “Wearable Health Technology Design: A Humanist Accessory Approach” presents relational ways of designing future wearable health technologies through explicitly addressing the physical, psychological and social body. It explores how accessories can function as a complex platform supporting relations between makers, wearers, and viewers. Moreover, it proposes a holistic model for wearer experience—a relational model in which the object is removed from the role of principal, and in which all actors are equal in society, thus situating the designer and the design process in society. Systematically analysing designers’ personal experiences can help us to understand cultural experience (Ellis, 2010) as well as new modes of living with regard to clothing. Could making the design process public be a strategy to support the adoption of a wearable by the sociotechnical system of fashion? Angella Mackey, Ron Wakkary, Stephan Wensveen, and Oscar Tomico in “Can I Wear This? Blending Clothing and Digital Expression by Wearing Dynamic Fabric” focus on filling gaps in the understanding of the social ecology of fashion, which they regard as being among the main reasons for the relatively low product adoption of wearables in society. They do so by taking an autoethnographic approach to material speculation. In their article, explorations of wearable technologies through the lens of sociocultural perspectives and clothing practice, as opposed to material or technological developments, reveal insights regarding the opportunities and challenges of blending clothing with smart technologies. The dynamics of daily living with digital technology on such an intimate basis allow one to distinguish opportunities and challenges as important as the technological developments that enabled them, thus bringing the digital to a new level of intimate, material, and social relations with our bodies. Technology will only become more present in our future design experiences. Wearables, because of their proximity to the body, present use scenarios that further exacerbate the social and aesthetic dimensions of technology. In all likelihood, the adoption of technologies on the body will only to continue to grow. Awareness of the design blocks existing in fashion will permit a first wave of adoption of wearables, which may very well engender future iterations of garments that bear no resemblance to current clothing and accessories. While garments provide practical solutions for safety, comfort and wellbeing, as history has shown, no one style is ever set in stone. For their part, digital interfaces are expanding practical use as well as expression for clothing and the body. Wearables design is a delicate admixture of futurity and familiarity that must be invented, tested and iterated on a social body. The current second wave of wearable design argues that style and social coherence are needed in order for fashiontech to become mainstream. However, style is a mercurial muse that must constantly be courted and reinvented. Design through technology and style is sure to engender uncharted sartorial relationships that are going to mark the next wave of fashionable and wearable interactions. This editorial is based on a conversation between Oscar Tomico (TU/e Wearable Senses Lab, ELISAVA) and Valerie Lamontagne (Concordia University, Design and Computation Arts). Valérie holds a PhD in “Performative Wearables: Bodies, Fashion and Technology” from Concordia University, Montréal (2017) where she is Adjunct Professor in Design and Computation Arts. She is the founder and director of the Fashiontech Festival in Montréal, and has exhibited and lectured internationally on wearables and fashiontech at conferences, as well as collaborated on notable exhibitions and events related to fashion innovation and media arts. In 2010, she started 3lectromode, a wearables electronics atelier dedicated to avant-garde crafting and consulting in fashionable technologies. Vibe-ing was designed between 2012 and 2013 at the TU/e Wearable Senses Lab by Eunjeong Jeon, Kristi Kuusk, Martijn ten Bhömer, and Jesse Asjes, in collaboration with the TextielMuseum Tilburg and Metatronics. Tender was designed in 2012 at the TU/e Wearable Senses Lab by Kristi Kuusk, Martijn ten Bhömer and Paula Kassenaar, in collaboration with the TextielMuseum Tilburg, Philips Lighting and Metatronics. Soft Interiors was designed in 2011 at Philips Lighting by Paula Kassenaar. Barnard, M. (2007). Fashion theory – A reader. London, UK: Routledge. Dunne, L. (2010). Smart clothing in practice: Key design barriers to commercialization. Fashion Practice, 2(1), 41-66. Ellis, C., Adams, T. E., & Bochner, A. P. (2010). Autoethnography: An overview. Forum: Qualitative Social Research, 12(1), Art. 10. Entwistle, J. (2000). The fashioned body: Fashion, dress and modern social theory. Oxford, UK: Blackwell. Loschek, I. (2009). When clothes become fashion: Design and innovation systems. Oxford, UK: Berg. McCann, J. (2016). Sportswear design for the active aging. Fashion Practice, 8(2), 234-256. Ten Bhömer, M., Tomico, O., & Wensveen, S. A. G. (2015). Designing ultra-personalized embodied smart textile services for well-being. In L. van Langenhove (Ed. ), Advances in smart medical textiles: Treatments and health monitoring (pp. 155-175). Cambridge, UK: Woodhead. Tomico, O., Winthagen, V., & van Heist, M. (2012). Designing for, with or within: 1st, 2nd and 3rd person points of view on designing for systems. In Proceedings of the 7th Nordic Conference on Human Computer Interaction: Making Sense Through Design (pp. 180-188). New York, NY: ACM. Tomico, O., Wensveen, S., Kuusk, K., ten Bhömer, M., Ahn, R., Toeters, M., & Versteeg, M. (2014). Day in the lab: Wearable Senses, Department of Industrial Design, TU Eindhoven. Interactions, 21(4), 16-19. Vallgårda, A. (2014). Giving form to computational things - Developing a practice of interaction design. Personal Ubiquitous Computing, 18(3), 577-592.